In the 1820s in France, Jean Fourier was investigating the behaviour of heat when his calculations revealed that the earth should not be as warm as it is. That is, the earth is too small and too far from the sun for it to be as warm and livable as it is. On its own, solar radiation is not enough. So what was warming the earth? As he pondered this question he came up with some suggestions. Among them is the idea that heat energy from the sun penetrates the earth's atmosphere, and that some was not escaping back into space. The warmed air, he suspected, must be acting as a kind of insulating blanket. He had described what now is commonly known as the Greenhouse Effect. Fourier was the first to do so. In the 1820s, Fourier did not have the technology to make the measurements needed to explore his hypothesis. Decades later, the Victoria natural historian, John Tyndall, brought a fresh perspective to Fourier's question and suggestion. As an avid mountain climber, Tyndall observed evidence of climate-induced changes in ice caps, and he conducted experiments to measure the heat trapping propertities. This led to his discovery that water vapour and carbon dioxied are good at trapping heat. Tyndall's insights captured the interst of a Swedish scientist. Svante Arrhenius figured out that earth's temperature is not regulated by water vapour because it recycles rapidly in and out of the atmosphere. Rather, he saw that carbon dioxide regulates temperature directly as it is a long-lived resident of the atmosphere that changes relatively slowly over time. 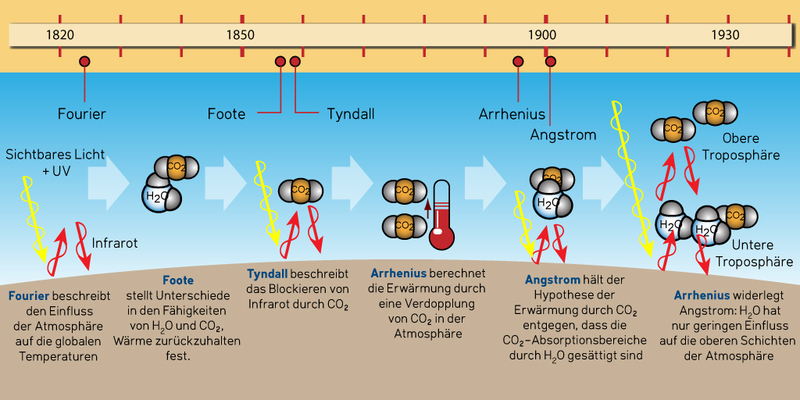 As Arrhenius explored these issues, he worked with his colleage Arvid Hogbom, a Swedish geologist who was studing natural carbon dioxide cycles. Hogbom had discovered that CO2 emissions from coal-burning factories were similar to emissions from some natural sources. The two investigators asked what would happen if emissions from human sources increased and accumulated over centuries. Arrhenius calculated that doubling the concentration of CO2 in the atmosphere would raise the global average temperature by 5 to 6°C. His conclusion was challenged and not accepted. Confirmation would take decades.